One couldn’t miss Robbie’s wren. From the moment we sat to sip a chilled white wine on her wooded deck in the late afternoon until we were enveloped by darkness while she worked a comforting bonfire, the little wren hopped from perch to perch and did so with constant chatter. From a Kon Tiki-like lantern to the crook of a shepherd’s hook, from the apex of the little wren house where his mate perhaps hid from his verbal onslaught, to a tall sunflower nearby, the little brown wren hopped from place to place, filling the silence. Said Robbie’s husband, Harland, “That’s the male. He never shuts up. The lady of the house never says much of anything. He, on the other hand, sings from the first light of morning until darkness.” Conversations. Earlier on that Friday I had erected my pop-up for the annual Cannon Falls Arts and Wine Festival. It was five years since I’ve seen Harland and Robbie, and even more since I had been in the Cannon River valley. This would be like “old home week” once the festival began the following morning. So we sat, catching up and enjoying an evening of remembrance while being serenaded with songs from Robbie’s wren. “Did that stop the noise?” I asked. Many times a day Robbie and Harland pause to watch their active bird feeders. 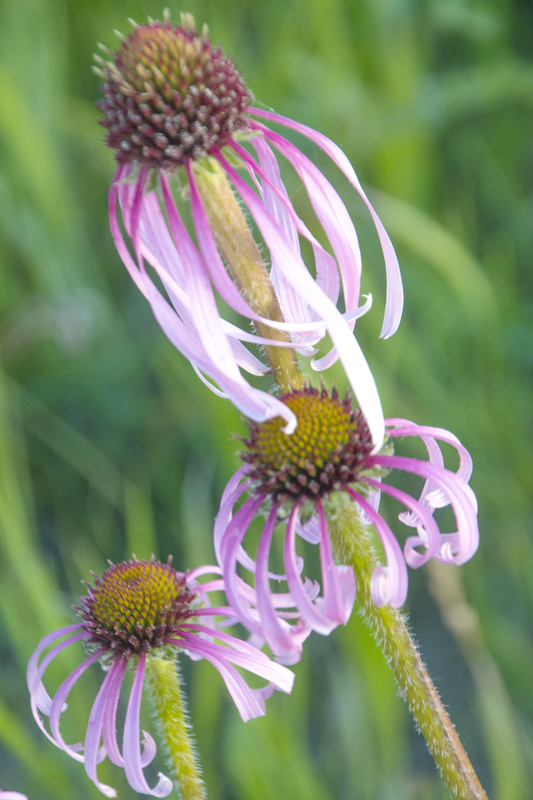 Praire enthusiasts seemed to enjoy images of prairie flowers. • Over the years I’ve wondered what athletes and various celebrities got out of hospital visits. Oh, there is that thought that of the viscousness those over the hill second string, junior high tackles who have since become more knowledgeable about football in middle age than Hall of Fame coach Bill Parcells, visiting terminally ill children in a hospital perhaps offered a nice relief. But, a reward? Then I went to visit Mariah, Robbie’s daughter, who is in the latter stages of MS. Named for “the prairie wind,” she can no longer walk. After the show closed on Saturday I dropped by her condo on the way back out to Harland and Robbie’s. When I walked in I was taken aback. Here was the lively and beautiful teenager who was seemingly always on the move now stretched out prone on her back, barely able to move. “You probably don’t remember me,” I said, telling her my name as I bent to give her a hug. “Oh my God! I can’t believe it!” she said, breaking into the most incredibly and beautiful smile I have ever seen, one that radiated across the room. A smile I’ll never forget. Genuinely pure and so rich. Now I think I know what the professional athletes mean when they talk about how special they feel when making hospital rounds. It’s those smiles. I smiled. Much like the musician smiled as they played the concerto. 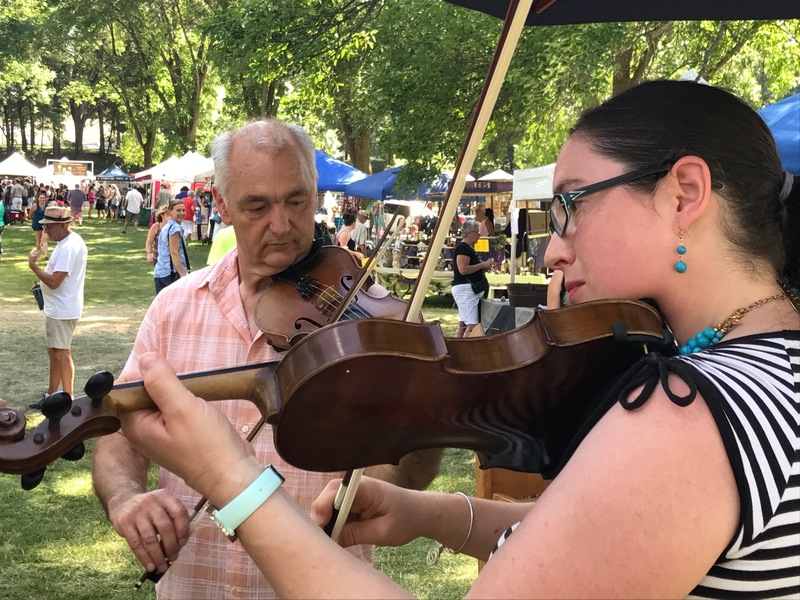 Exhibiting multi-talented artist Heather Friedli played a short concerto with a strolling musician. 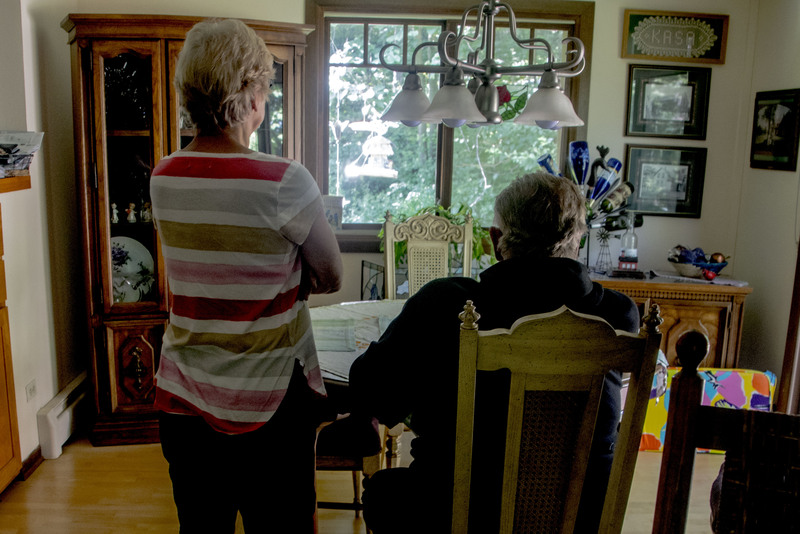 • Driving back to Robbie’s farm late Sunday afternoon after packing up to return their borrowed chair and to pick up my belongings before the drive home, I passed Mariah’s little condo and remembered my late friend, Foster Hall. Foster, also an artist, often spoke of finding and marrying his “dream” of an “exotic” woman. Eventually he met and married a sweet, dark-complected Jewish girl from New Jersey with wild and frizzy hair who possessed a flair for adventure. She was indeed “exotic” to Foster, an only child of an older Sante Fe couple. Not long after their wedding he was diagnosed with ALS, and his decline was rapid and sure. We were visiting about six months after he’d lost he ability to walk, and several weeks before his death. No, you never really know what to say, or to talk about, so to fill the awkward spaces of silence I asked Foster about his dreams. “Running,” he said with drawn out effort, his words slurred by the disease. “All I ever dream about is running.” I wondered about Mariah’s dreams. Robbie’s little wren on the apex of the Shepherd’s crook. • Robbie and Harland were sitting on their deck when I arrived late in the afternoon. “He’s still at it,” Harland said as I carried the chair up the hill and joined them for a few moments before starting for home. Sure enough, there on the Kon Tiki lantern was Robbie’s wren, tail angled at a sharp 45 degrees, as he tilted back with a song deep in his heart. Seconds later he flitted up to the apex of the Shepherd’s crook, his highest point of the many perches he preferred, looking this way and that, singing his song of the ages. I wondered why. I wondered how could he keep this up without seemingly ever stopping, day after day, all summer long. Was he singing a warning? Re-establishing on a constant basis that this beautiful deck surrounded by wood was indeed his marked territory? Or, perhaps, was he simply uncomfortable with silence?